Greeks reacted with relief that the deal averted a banking crisis which fellow eurozone member Ireland said could have erupted in the coming week. Finance Minister Yanis Varoufakis said the reform promises would be ready and submitted to Greece's EU and IMF partners in good time. Another government official said the reforms would include a crackdown on tax evasion and corruption. Elsewhere in Japan, analysts expect the central bank to embark on more stimulus later this year, topping up its latest round launched in October, to support economic growth and ensure rises in inflation. Seeking to wrench the country out of nearly two decades of deflation, BOJ Governor Haruhiko Kuroda unleashed an unprecedented burst of monetary stimulus in April 2013, saying the aim was to achieve 2 percent inflation in roughly two years. However, he declared in January last month that the time-frame was not set in stone and noted that a steep slide in oil prices had derailed earlier expectations. A Reuters Corporate Survey, conducted between 2nd February and 17th February, showed that while most firms want consumer inflation to be higher than the current 0.5 percent, an overwhelming 80% were content with levels of less than 2 percent. Last week, Bank of Japan chief Haruhiko Kuroda said he saw no need for stimulus but added he would not hesitate to ease again if circumstances warranted. The 60 percent slide in oil prices between June 2014 and January 2015 has also boosted hopes that Japanese companies will reap some windfall profits as their hefty fuel import costs drop. Canada: Core CPI m/m. Thursday, 26th February, 9.30pm. I expect figures to come in at 0.1% (previous figure was -0.3%). USA: CPI m/m. Thursday. 26th February, 9.30pm. I expect figures to come in at -0.6% (previous figure was -0.4%). USA: Prelim GDP q/q. Friday, 27th February, 9.30pm. I expect figures to come in above 2% (previous figure was 2.6%). 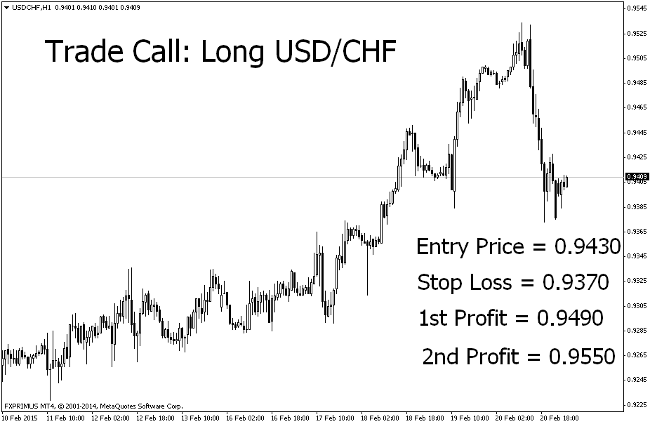 On the H1 chart, USD/CHF has fallen into a range after moving in a consistent uptrend from 6th February, clearing over 360 pips to touch a high of 0.9534 on 20th February. I expect the uptrend to continue this week. Hence, an entry is taken at 0.9430 with a stop loss of 60 pips placed below the last low. We will have two targets on this trade, exiting the first position at 0.9490 and the second one at 0.9550.